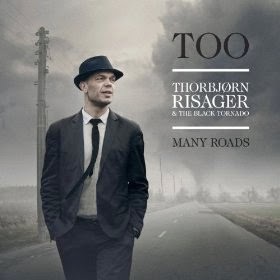 I just received the newest release, Too Many Roads, from Thorbjørn Risager & The Black Tornado and it's classic blues rock. Opening with If You Wanna Leave, a driving shuffle track with Risager and Peter Skjerning on guitar, and backing horn work from Kasper Wagner (sax), Hans Nybo (sax) and Peter W Kehl (trumpet). Title track, Too Many Roads takes a more traditional route with Risager on dobro and slide contrasting against his firm but rugged vocals. Lea Thorlann and Pia Trojgaard add warm backing vocals giving it a southern country blues feel. Acoustic ballad, China Gate has a real rural feel accompanied only but acoustic guitar, solitary electric guitar and keys. Very nice. Paradise is an uptempo foot stomper with an almost spiritual feel. This nicely composed blues track backed by Emil Balsgaard on keys, Martin Seidelin on drums and percussion and again nice horn work makes for a very cool track. Drowning is a really effective use of instrumentation to showcase Risager's voice. Isolated but well blended into this sensitive track with key bass work from Soren Bojgaard and artistic inclusion of guitar riffs, horn work and keyboard make this quite and interesting track. Backseat Driver is a quiet rocker waiting to erupt. Balsgaard breaks through the myst on keys and is followed shortly thereafter by Kehl. Solid vocals by Risager overall give this track a lot of interest. Through The Tears has a flavorful R&B sound showing not only Risager's versatility as a soulful singer (which he does really well) but also the adaptability of the band to carry off a track so well. Very nice. High Rolling is a pure blues rocker with a stiff back beat but what grabs me by the short hairs is the great grinding guitar tones on this track. A stinging guitar breakout on this track accented by horn work pushes Risager into yet another vocal style and well done. Red Hot and Blue efficiently blends R&B, pop, ska and rock for a unique feel. Horn work on this track is particularly effective and with the addition of stylized percussion, the track seems to dance on it's own. Rich Man has a low slung delta swing feel with super vocal work from Risager and particularly articulate piano work from Balsgaard. The horn section steps up for a cool break out giving the track a New Orleans flavor. Wrapping the release is a piano boogie Play On, with Risager and pianist Balsgaard leading the way. A fast Rock and Roll pace (a la Jerry Lee Lewis or Little Richard) gives Balsgaard a real wide opening to really hammer out a cool boogie. This release has it's own sound and Risager has a unique and very solid voice. This is a tight band and a cool release.